Includes a FREE copy of NewBlue Titler Live Present (a $449 $299 value). Not sure which Wirecast product you need? View our product comparison chart. Sports Data Integration: Display sports data from scoreboard with SportZcast, Datalink and StatCrew. Scoreboard Controllers: Control the entire scoreboard from the same machine, or another on your network with full-featured HTML web interfaces. Remote Operation: Operate your scoreboard and graphics from anywhere in your network with HTML web controllers. Social Integration: Capture posts and comments from popular social services including Twitter, Facebook, and YouTube. Audience Polling: Show polling results from your audience in real-time with live text and animated bar, pie charts. Social Management: Search, filter and queue your messages to create a playlist for your show. Organize Your Information: Drive your production from single spreadsheet file with automated graphics creation. Web Connected Graphics: Generate graphics from a web connected data sources including text files. Combine the power of Sport, Social and Present for a comprehensive toolset. Data Connectivity: Drive graphics from automated input behaviors, including spreadsheets, RSS feeds, social media and more. Unlimited Designs: Choose from a range of pre-built templates or design your own with over 120 effects, transitions and animations. Double the Power: Two layers of live graphics to mix and match sports, social media, spreadsheet-driven lower thirds, and more – all in one live production. Experience our most powerful graphics solution for professional broadcasters. Data Connectivity: Flexibly import existing graphics from any design source, including Adobe® Photoshop® and After Effects®, or customize ready-to-use designs in the included Title Designer. Leverage Any Design: Seamlessly connect to your data to prepare dynamic on-air graphics for any professional broadcast. Quickly search and select data within a spreadsheet to bring it into a design. Even control your graphics with a powerful API to customize your workflows and incorporate any of your information. Unlimited Playout Power: Deliver unlimited layers of 3D animated graphics - per channel - on up to 16 channels of 4K-NDI or 4K-SDI key/fill. Experience real-time playout and gain more control over your graphics with automated graphic sequencing, quick design/data search tools and more. Combine the power of Produce, Sport and Social for a comprehensive toolset. ¹Requires purchase of Wirecast Studio. ²Requires purchase of Wirecast Pro. ³Titler Live pricing for Wirecast Studio. 4Titler Live pricing for Wirecast Pro. Not sure which Titler Live product you need? View our product comparison chart. Studio 188 – an office with rich wood furniture and optional desk. Studio 189 – perfect presentations and is configurable with screens, a desk, and a table. Studio 190 – a virtual news studio with a control room, optional desk, and configurable monitors. Studio 191 – an amazing stage that can be configured for music, news, and presentations. Studio 192 – a New York Loft Studio with optional screens and furniture. Studio 193 – a server control center with racks of computers and a control panel. Studio 194 – a sports news desk with optional desk and replacable background to change sports. Studio 196 – an airy library with optional monitors and furniture. Studio 197 – a news desk with replacable skyline and optional monitors and desk. Studio 200 – a virtual news studio with a control room, optional desk, and configurable monitors. 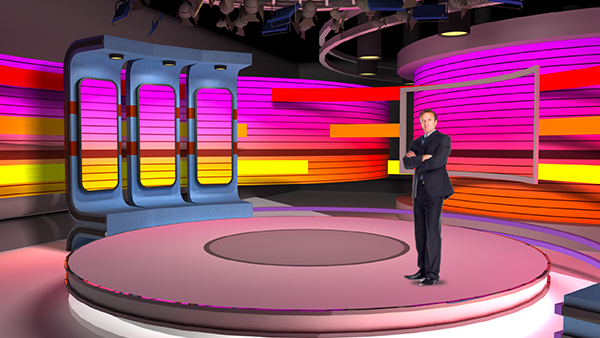 Studio 202 – a colorful and curving presentation stage. Studio 207 – a large news room with multiple locations and optional screens and desks.